You all know I’m a movie loving lady, so a couple of nights ago I had a little movie night get together in order to get myself psyched up for the Oscars – which are on in only two more days (depending on the time you read this post, lol)! are non GMO, and are Kosher Certified. 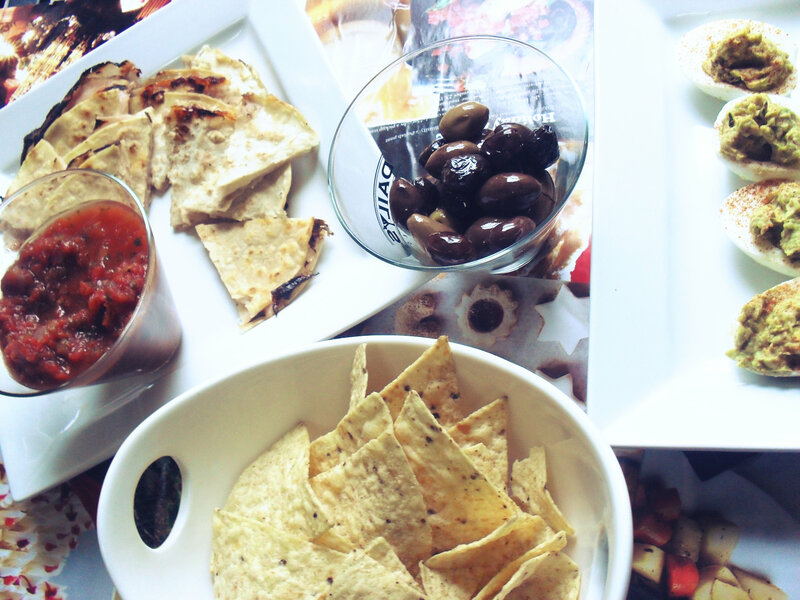 Of course, no movie night party is complete without chips, salsa, and guacamole! 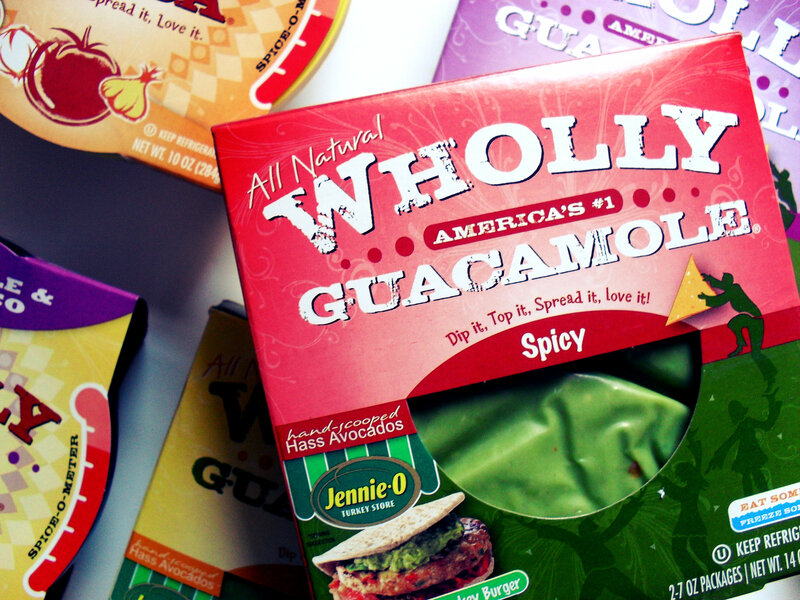 Wholly guacamole makes my most favorite salsa so I was really excited to get my hands on some of their creations. I love how their salsa always tastes really really fresh – the flavor of the tomato really comes through, and it always delivers that really great spicy kick that I just love. Seriously perfect dipping salsa. 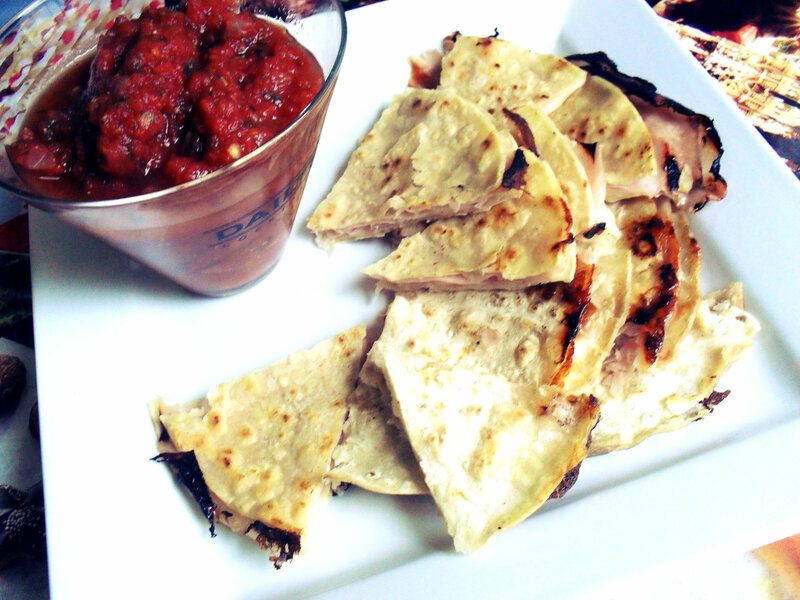 I made some super yummy ham and provolone quesadillas to dip in our Wholly Salsa! And no proper party is complete without some Daily’s, and it only seems appropriate to have champagne at a pre-Oscars viewing party! 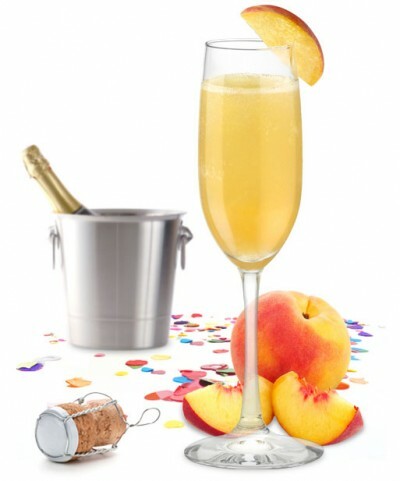 Daily’s has loads of tips and recipes that make entertaining a whole lot easier on their site here, and for the recipe for the (seriously) delicious celebratory drink – Peach Party Champagne click here or on the image below. 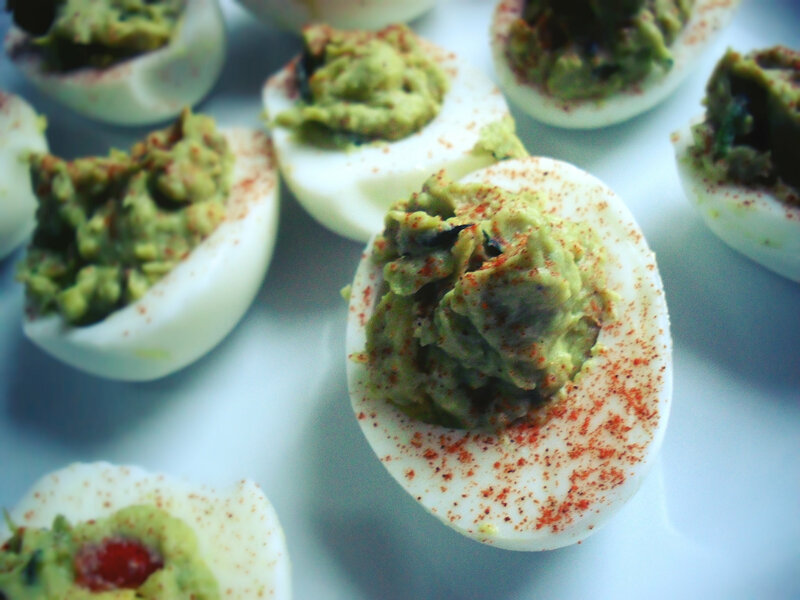 And while I normally don’t cook at all for movie night, I just had to try Wholly Guacamole’s Guacamole Deviled Eggs (recipe here). Instead of using the basic guac, I used spicy guacamole – which added a welcome kick to the filling. These were surprisingly delicious and even more surprisingly- easy to make! I loved loved loved them and so did my movie-watching buddies! So because Joaquin Phoenix is nominated for Best Actor in a Leading role, we decided to watch (drumroll please)… The Village! Woohoo! The Village is one of my all-time favorite movies, I love the suspense and the relationship between Lucius (Phoenix) and Ivy and well as Lucius and his mom. However, our party lasted a little longer than I had expected and we also ended up watching another Joaquin Phoenix film – Walk the Line, which is also another all-time favorite! I own the soundtrack, and know the whole movie line for line and it never gets old. Phoenix does an amazing job as Johnny Cash to Reese Witherspoon’s June Carter Cash. It was a totally eventful, fun night, fueled with yummy snacks and drinks! Now it gets even better, the wonderful folks at Wholly Guacamole not only invite YOU to join us at an exclusive “Red Carpet Ready” twitter party during the Oscars on February 24th! Just follow along with the hashtags #Oscars and #RedCarpetReady — share your movie night photos, dish on the Red Carpet fashion, and share your opinions on the winners and losers! And in addition to your #RedCarpetReady invite, Wholly Guacamole will also be gifting one of my lucky readers with their own Red Carpet Ready prize pack including Wholly Guacamole and Wholly Salsa products, promo items from Wholly Guacamole and Daily’s, AND a $20 Walmart gift card! How awesome is that?! To Enter, Please Leave One Comment PER Entry! Optional, but much appreciated! Also leave one comment per entry for these as well! Make sure to join @eatwholly & @dailyscocktails for a #RedCarpetReady twitter party live during the #Oscars on February 24th!!! Giveaway Ends on 2/28/12 at 11:59 p.m. EST. *I was provided with product samples from Wholly Guacamole in order to facilitate this review. My opinions are my own and are not influenced in any way. I Like Wholly Guacamole on Facebook! I Like Daily’s Cocktails on Facebook! I Follow Daily’s on Twitter. I like Wholly Guacamole on FB. I like Daily’s Cocktails on FB. I like dailys cocktails on fb. I Like Daily’s Cocktails on Facebook. I like Dailys Cocktails on facebook. I’m a fan of Wholly and Daily’s. Together and a weekend yum! Liked Dailys Cocktails on FB! I like Wholly Guac on facebook. I like Daily’s on Facebook.